are the perfect product for "baby boomers" and the perfect add-on for sunglasses. No more squinting...no more stacking two pair of glasses. These ingenious plastic lenses solve the need for magnification in a clever and convenient way. the choice of sunglasses is yours. Bring Fun Back into Focus! that statically cling to the inside of any sunglasses. Once installed, you have instant magnification, and no one knows but You! ORBIS, the Flying Eye Hospital ! Choose the Power That's Right for You! +2.00 your eyes 24 inches away and read this sample type. +1.75 Continue until you reach the first line that is not clear. +1.25 the left of the line is the one you need. This reading test is just an approximation and not meant to replace continuous eye exams with an eye care professional. Wash your hands, sunglasses, and Optx 20/20 lenses with liquid soap and warm water to remove any dust and oils. Rinse thoroughly with clean, warm water. 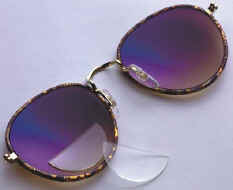 With clear water in the inside of your sunglasses, press lens onto the bottom 25% of each sunglass lens. Align lens with the bottom of your eyelashes and center with the center of your pupil. To check for proper placement, put on your sunglasses and look through your Optx 20/20 lenses. Placement adjustments are easily made by sliding your Optx 20/20 lenses while they are still wet. When properly positioned, press the excess water gently to the sides. Pat dry with a lint-free towel. Allow lenses to dry completely before using. Optx 20/20 lenses are completely removable, and can be re-installed by repeating these instructions.